This is the second post in a mini series I’m doing on how I use Todoist (here’s the first post). The first was about how I stay focused using a custom start page. MIT’s, or Most Important Tasks, is a concept I got from Zen to Done. ZTD, written by Leo Babauta of Zen Habits fame, is a simplified and more practical take on Getting Things Done. It’s a short book and much more approachable than GTD. Each morning – or if I’m really organised, the evening before – I decide on what my MIT’s are for the day. I try and choose about 3 things which I do this by assigning priority 1 or priority 2 to those tasks. This filter then shows any tasks that are marked as priority 1 or priority 2 and are either overdue or due today. There’s usually around 10 tasks in my Today view, but the MIT’s are what I focus on. I’ll try and get them done early in the day if possible so that other things don’t get in the way. The Errands filter shows any tasks that are labelled @Errands or @Groceries. I add things that I need to Todoist with either of those two labels. That way, when I’m in a supermarket or need to run errands, I just use this filter so that I won’t forget the milk or batteries or whatever else it is I might need. A few times a week, I’ll use this filter to help clear out the small tasks that I need to get done. First, I go through Todoist and add the label @Batch to any small tasks that will take around 10 minutes or less to complete. I then sit down for around an hour and blast through this filter. Tasks that I might batch include updating a client on a project, sending or keeping on top of invoices, making a quick phone call, small updates to a client website, and so on. I can often get through 4-10 tasks in just an hour by using this filter. 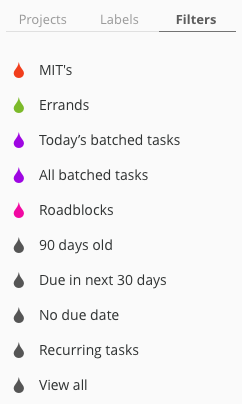 Similar to the filter above, this shows all tasks labelled @Batch but regardless of due date. If I have a spare 30 minutes and my tasks for the day are complete, I’ll often work from this list. If I’m waiting on something from someone, I’ll add it as a task with a label of @Waiting. This filter than shows all the things I’m waiting on over the next week. I review this filter at the start of the week so I can plan accordingly. It’s also useful as a reminder to follow up if necessary. The filters I have marked in grey are part of my monthly review. This filter shows all tasks that were created over 90 days ago. Tasks that appear in this filter are often tasks that have slipped through the cracks and need scheduling or are no longer important and can be deleted. This filter shows all tasks that are due in the next 30 days. During the review, I look over what needs to be done in the next month. One of things I like about this filter is it helps spot particularly busy days so I can move tasks around accordingly. As you’d expect, this filter lists all tasks without a due date. Like the 90 days old filter, this helps surface tasks that I may have forgotten about or are no longer important and can be removed. I have a Routines project with Daily, Weekly, Monthly and Periodic recurring tasks. This filter shows them all as well as any recurring tasks in other projects. I like to review them on a monthly basis because too many recurring tasks can easily clog up the system. This shows all the tasks in my Todoist account, ordered by project. I don’t use this filter very often but it is handy for major reviews.